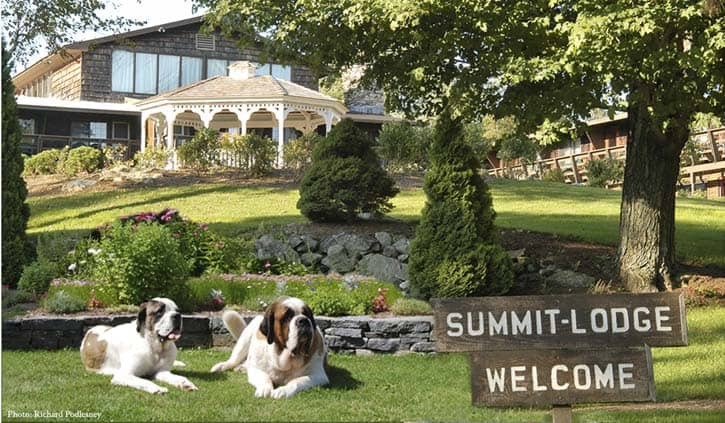 Saint Bernards have been a staple at Summit Lodge for nearly 40 years. Here, two of them pose on the grounds. KILLINGTON — Selling Summit Lodge wasn’t just about the money. Owner Billy Bauer had to find a successor that was the right fit. “I was very selective,” he said. The lodge had been on the market for about two years and over that time there has been “a parade of people who’ve come through these doors,” Bauer said. Bauer found the right fit in Emmett O’Dwyer and his wife Laura. On Thursday, March 3 he signed the closing papers purchasing the property and business for $1.4 million. The 16,305 sq. ft. lodge includes a 180-seat dining room, 45 guest rooms, an outdoor pool and is on 8.36 acres. Bauer plans to stay on through the end of the winter to help the new family transition. Typically, the lodge closes in early April for 4 to 6 weeks to work on spring improvement projects, Bauer explained. He’ll leave during that time, but plans to come back in May and June to help get everything up and running again and to host his golf tournament the weekend of June 3. Bauer has been a part of Summit Lodge since 1977—39 years. He came to Killington as a ski bum, and got a job as dishwasher at the Summit that winter “and I never left,” he explained. He has since held every job at the lodge, including working in the kitchen after his boss sent him to culinary school. In 1986, nine years after he arrived in Killington, he and Summit Lodge owner Ken Budzyna built the Grist Mill Restaurant. “I became the general manager for the Summit and Kenny was the general manager for the Grist Mill,” he explained. In 2005, Bauer bought out Budzyna with David Gouchberg, his partner. Then, in October 2015, they sold the Grist Mill (now the Foundry) to local restauranteur Chris Karr, who had been leasing the restaurant for the past three years. Summit Lodge was the last Vermont property Bauer owned. In addition to his business ventures, Bauer served on the Killington Select Board for nine years, from 1990-1999, and was a co-founder of Green Mountain National Golf Course, of which he is very proud. While he originally came here to ski, it’s been about six years since he’s hit the slopes. “I just lost my passion for skiing,” he explained, but he does enjoy snowshoeing in the winter months and, of course, he loves to play golf. Being on call all day everyday, however, also has its downsides. He has never gotten to eat a turkey dinner on Thanksgiving with extended family, for example. Bauer plans to move to Charlotte, N.C., where members of his family now live, including nieces and nephews. He plans to take a break from work for a while, but then plans to pursue an online business concept that he’s been thinking about for a while. (While he wouldn’t elaborate, he said it has to do with golf, indirectly.) For someone who’s used to being as busy as Billy Bauer, it’s not surprising that he’ll have to ease into retirement! “I am the only person here who is leaving,” he added, pointing to Bill Miller, who has been the assistant manager for 20 years and will now take on the role of general manager; Sandy Guertin, who has spent 22 years as dining room and banquet manager; Dave Auty, who has handled the maintenance for the past 20 years; and Chef Stephen Hatch, who has been running the kitchen since 2011. “I have no doubt that Emmett will be successful here. He’ll have a lot of help and he’s very smart guy,” said Bauer. Emmett and Laura O’Dwyer are moving to Vermont with their 2-year-old daughter, Orlaith. They will be moving from South Florida, but Emmett is originally from Ireland; Laura from Pittsburgh. Emmett has over 20 years of experience in the food and beverage industry, according to Bauer. A big part of the O’Dwyer family decision to move here was personal: they love the community, local schools and family values, in addition to the business opportunity, Emmett said. The Mountain Times is planning to meet Emmett O’Dwyer when he comes back to town next week. Look for a story in the March 23 edition when we will profile O’Dwyer and ask him about his plans for the future of Summit Lodge, including whether they plan to keep dogs as an iconic part of Summit Lodge’s identity? Billy you mentioned you will be staying on for a while but are the dogs staying also? Love coming up to play golf there in june with the rabbit group. While it is with great sadness to know Bill is leaving, I am happy for him to find freedom. I wish him the best in his future endeavors. We have been loyal patrons of the Summit once we discovered it and will see what the future holds with the new owners. We will continue to make this our “go to” place when we are in Killington and support the staff of the Summit. Continued success to the new owners. My wife and I have been coming to the summit for over 35 years. Our three children have been coming since before they were old enough to ski. The Summit has been a major part of our ski time at Killington. We are very sorry to see Bill go since to us he is the The heart and soul of the Summit but we do with him the best of luck. Question? Wasn’t the Grist Mill in operation several years prior to 1986?